Ever since the age of 7 I had always been able to fish thanks to my Grandfather teaching me, and this is a passion that has stayed with me for another 26 years. As each year goes by technology evolves and changes the way we live our lives and do general activities, this is even relevant to fishing. Yes! Apparently to my surprise gone are the days of having to stay focused on the float waiting for it to fly under the water….. I moved to Essex just over two years ago not really knowing anybody, so I would go every other weekend up to the local fishing lake on my own. There I am at a lake quite happy sat there using the techniques taught to me by my Grandfather, having a certain amount of success but I start seeing other people catching larger specimen carp using completely different techniques to those I know. Oh how I would love to feel that adrenalin of having that big curve in the rod but how to I begin….. Through my connections at the Volunteer Centre I met someone called Stuart who know the fishing lakes in the area and he fished the new-fangled way. After a passionate discussion about all things fishing related we arranged to go for a couple of hours fishing in an afternoon so he could see what gear I had and how I fished and start giving me some tips. As we chatted Stuart explained that he loves fishing but none of his friends do so usually goes on his own which is fine but it’s always good to have someone to boast to when you hook that whopper. Since t hat first afternoon Stuart become a fishing buddy and would text me with links to YouTube videos, and more important tips on what gear to buy. After bringing myself out of the fishing dark ages, with my new gear in tow and my fishing confidence at new height thanks to my own personal “Mat Hayes” 6 am on a Sunday morning I was ready to face the monsters. 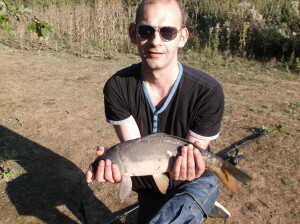 That day using all the techniques taught to me I managed to catch my personal best carp of 16lb, since then I have started to teach someone with no fishing ability how to fish the good old way with the aim when they are confident to pass on my new skills to them. I now wonder what my Grandfather would make of all these new fishing tricks I’m sure he would stand by the old ways and issue a challenge.